Hosted at the Stanford University, the Hoover Institution on War, Revolution and Peace is a public policy research center devoted to the advanced study of politics, economics, and political economy, both domestic and foreign, as well as international affairs. Its Library and Archives physical structure with more than 1.6 million volumes and more than fifty million documents is an outstanding source worldwide for research on these topics. Online resources of this huge archive are also remarkable and the website provides access to a relevant number of records. Annotated and commented records as well as articles, reports, essays, newsletters and comments are retrievable for free by all users. Access to the Institute journals, covering a wide range of public policy issues, is also available to the public, while full-text books usually require a fee and abstracts and tables of contents can be accessed free of charge. An efficient search engine enables also users to retrieve detailed information on the institute activities, programs, awards and researchers. 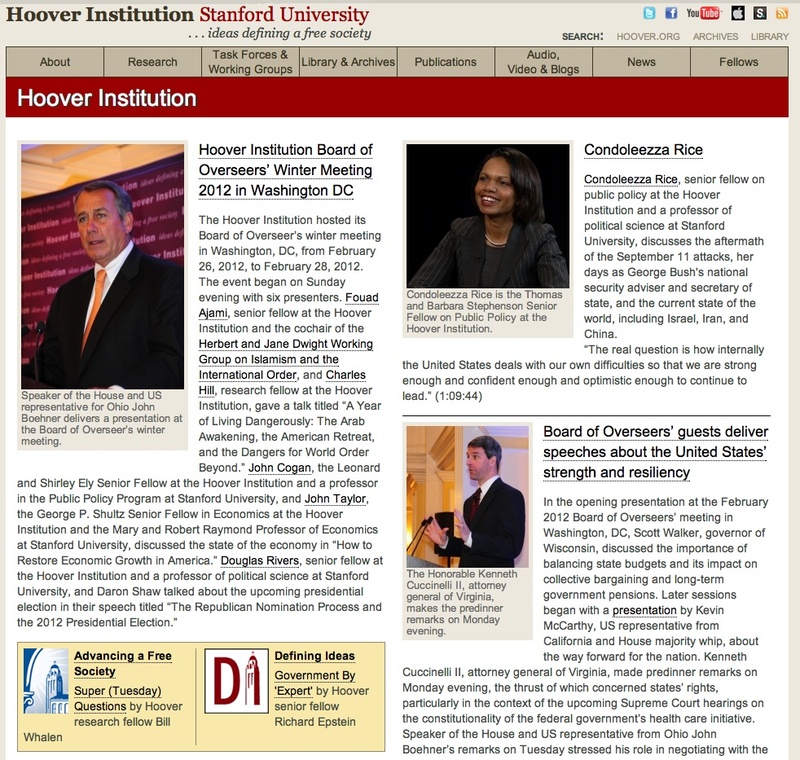 A collection of online news articles by or about Hoover scholars is also provided here and have an excellent updating rate, with news posted mostly daily. Comprising a well-organized structure, a comprehensive FAQ file and a sitemap, this site is generally easy to navigate.